Lactose & dairy free. Can be made vegetarian/vegan & can be made gluten free. Heat olive oil in a medium pan. Add carrot and celery and gently sauté until slightly softened. Add potato, zucchini, chicken, tinned tomato, water and rice. Simmer gently for 15 mins until the rice is cooked and the potato soft. Add salt, pepper, and stir in basil. Pour into serving bowls. 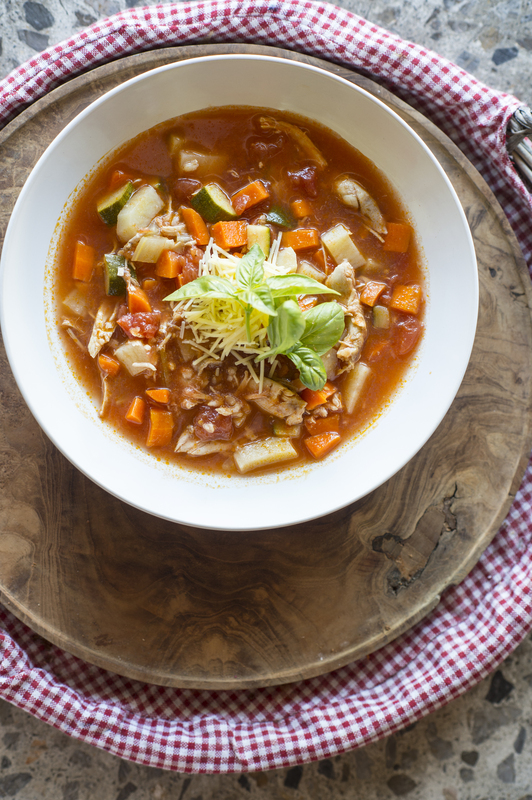 Optional: Serve each bowl of soup with a generous sprinkle of parmesan and drizzle of olive oil. Hint Instead of chicken you can add another protein option such as 1 1/2 cups chickpeas or lentils (this amount should be tolerated as the meal serves 6) or you can add firm tofu. Use homemade cooked roast chicken if needing gluten free option.